Shop restaurant bar stools from BizChair. Available in a range of styles, designs and colors, we can help you establish the perfect, stylish seating solutions for your bar or restaurant. Our restaurant bar stools are made to create a polished look while ensuring customers are comfortable. Designed for use in coffee shops, cafes, bars, diners, restaurants and other businesses, restaurant bar stools are ideal for dining or sitting at the bar, or as quality seating options for customers waiting for their tables. Restaurant bar stools make an undeniable statement about your venue's style, and our bar stools are available in a variety of seat materials, back styles and frame heights for customized versatility. With endless choices in restaurant bar stools, we want to make sure you find the best style for your space. These recommendations address some key decisions that should help you narrow down your choice. Measure: Take a measurement of your bar, table or counter from the floor to the underside of the surface. Determine quantity: Figure out the number of restaurant bar stools you'll need. Follow industry standards that allow 24 to 30 inches of space between the stools, so patrons will have plenty of room. Pick features and style: Choose from stools with or without backs, with or without armrests, and more. Counter-height: Our 28-inch counter-height bar stools pair well with table heights between 35 to 37 inches. Bar-height: For table heights measuring 41 to 43 inches, opt for 29-inch bar stools, 30-inch bar stools, 31-inch bar stools, or 32-inch bar stools. Extra-tall: Pair 33-inch bar stools with tables featuring 44 to 47-inch heights. 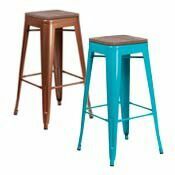 Most restaurant bar stools come in either wood or metal frames. Wood bar stools are a great choice if you prefer more of a traditional look. Made from top-quality hardwoods, these stools come in multiple colors to suit your existing décor. Metal bar stools range from traditional to modern styles and are available in swivel and non-swivel options. All of our metal bar stools are durable enough to withstand high-traffic businesses while still providing a comfortable place for patrons to sit. When it comes to selecting the right restaurant bar stool seat width, consideration for comfort is key. While going with smaller seat sizes may allow you to fit more stools at your counter or bar, a larger size may offer a more comfortable experience for your guests. Whatever you decide on, make sure you leave at least 24 inches of space between seating. Your restaurant serves many patrons on a single day, and our restaurant bar stools offer the perfect way for you to create a relaxing environment for each customer. Shop our full inventory of restaurant bar stools and other restaurant furniture to create the perfect dining or drinking space.